Many of us still feel a sense of regret whenever we remember something in the past, even when everything is said and done. We will be discussing how to live in the present, and not dwell on past mistakes? There’s a saying that goes, “When your past calls, don’t answer. It has nothing new to say.” Painful as it may seem, a lot of us still try to hold on to past memories that make us feel a sense of regret. The constant replay of past memories, decisions, and interactions with people go over and over that sometimes torture our minds. Have you ever heard of the term “rumination“? Its original use came from the habits done by cows. When cows eat grass, they regurgitate in the first instance. After this, they chew on the same grass again, all with the presence of spit and dirt. The same can be said about human rumination. We have already “regurgitated” the past, yet some of us still choose to chew on it the second instance, and sometimes even multiple times. Although cows benefit from rumination, we certainly don’t. There’s a study that showed that those who keep on dwelling in the past are more prone to being depressed. Participants were divided, and some were asked to ruminate, while others performed healthy holistic distractions such as meditation and yoga. The study proved that those who are in the ruminating state reported more depressive moods. When people think of the past constantly, the repeated thoughts and statements alter their perception. This may prove to be challenging if they want to make present decisions, but are crippled by their past thoughts. Another study found out that women who constantly ruminated waited 2 months longer to get a checkup upon discovery of a breast lump, compared to those who didn’t ruminate. Rumination does not only come with psychological effects, but it can also bring out negative physical problems. Those who constantly ruminate may find themselves in a prolonged stressed state, which often causes high blood pressure, and possibly, a higher risk of cardiovascular disease. 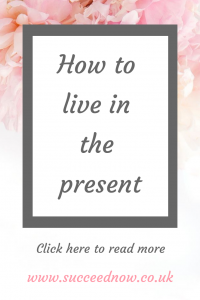 Given the alarming concerns that dwelling in the past can bring, what are some ways to live in the present with no regrets? Here are some of the actionable tips you can start today. Did you know that de-cluttering is also a great way to destress? Some of us may experience ruminating moods due to certain triggers. For example, you may have seen an old decor that reminded you of a horrible past relationship or an old plane ticket that brought painful memories. Getting rid of these items in your home is somewhat symbolic–as you throw away these items in the trash, you are also throwing the bad memories that go with it. With a few exceptions of important documents, you can sort your items according to its usefulness. A good question to ask yourself when you are pondering about keeping an item is: “Does this bring me joy?” This is a question that minimalists often ask. Tidying up your space can help you focus on the present more. In life, there are many things you cannot control–an overbearing boss, an inevitable argument with a loved one, or waking up with bad hair. However, there are some things that you can still take charge of, and that is your response towards things. Smiling more is a great way to reduce stress, to bring a positive perspective, and to help you socialize better. Even the simple act of smiling even without a reason is known to boost your mood. If you find yourself down in the dumps, why not stretch your facial muscles and smile? It can help you focus on the good things that happened that day instead of the less-favorable ones. Living in the present means learning to be thankful for the things you have now, instead of worrying about the things that you don’t have yet. Sometimes, people stress themselves out with constant thoughts about how they are going to achieve their far-set goals, without even considering the things that they already have. Having a thankfulness journal can be helpful for you to see the blessings that you already have. List them down before you begin your day. Whether it’s as simple as being able to eat a good breakfast, or enjoying the time with your family–all blessings are something to be thankful for. You never know how much people are wishing to be in your place. Nursing a grudge is a terrible way to live in the present. The more you hold on to past hurts, the more that it damages you and the relationship you had with the other person. Remember, forgiveness is not just about the other person–it’s more about you. It’s vital to your healing, it helps you close windows of pain, and it allows you to focus on the present. You don’t even have to wait for an apology to forgive someone. If you can reach out to them by simply saying “I forgive you”, it releases you from all the bitterness you may have carried over the years. It’s one thing to do what you love, but it takes a great person to love what they do. Even if you feel dissatisfied with your present state, use it as fuel to work harder and take baby steps towards your dream. Sure, you may regret certain decisions that led you to the life you have now. But the thing is, there’s still the present and future for you to change. Even with small steps, you can pave your way to a new direction as long as you keep loving what you do. Instead of blaming yourself and torturing your mind with thoughts of regret, place yourself in a different perspective. The past is not there to continuously torment you but to offer you insight on what you can do in the present and future. It is easy to get stuck thinking that things won’t get better when we actually have the choice to turn things around. The point of living is not to avoid mistakes, but to learn from them–the past can be used as a tool to improve ourselves today and in the future. As you understand these different strategies, remember that we are all imperfect people–we do things we wish we didn’t, we might have said things we want to take back–and yet, these imperfections are what makes our stories unique from everyone else. It’s up to us if we decide to dwell in the past or make an impact by inspiring others to live in the present. Nicole is a writer and educator based in Michigan and believes that her writing is an extension of her career as a tutor since they both encourage learning and discussing new things. When she isn’t writing, you might find Nicole running, hiking, or swimming. She’s participated in several 10K races and hopes to compete in a marathon one day.